This year the New Year in Eau Claire started off with a literal bang – actually, hundreds of them. For the first time in recent history, the City of Eau Claire held a New Year’s Eve celebration at multiple venues throughout downtown, on Barstow Street, and in Phoenix Park, where a surprisingly impressive fireworks display launched from the point at precisely midnight. With fairly favorable weather, the first-year experiment definitely proved the concept has legs as thousands of people gathered for food and drinks, tons of live music, dancing, lantern parades, those fireworks, and more. While activity was spread throughout pretty much every downtown venue, the main center of gravity for the event was in and around the Lismore Hotel, where just outside Visit Eau Claire’s Air Stream trailer/stage anchored the event. Hundreds took part in the kids’ little lantern parade at 5pm, and in the full lantern parade later on that night. While all this activity got the new tradition off to a great start, the real promise lies two years ahead, when the Confluence Arts Center and its public plaza will become ground zero for New Year’s Eve activities. 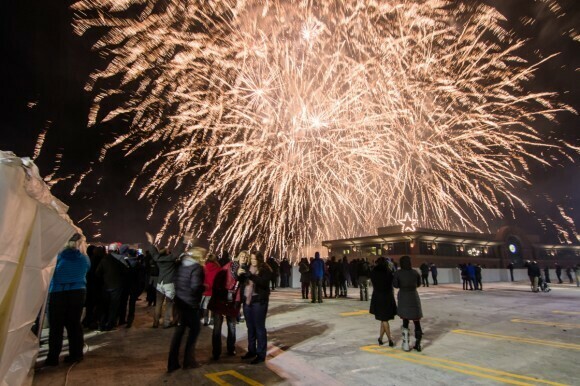 Imagine thousands of citizens gathered in the arts center and on the plaza, with fireworks overhead, all celebrating each other, our community, and a new year. Well you won’t have to only imagine for long, because after one more exploration of the concept for NYE 2017, it will all be a reality by the following year. And after that, I have a feeling the new tradition will be here to stay. Happy New Year!